Sushant Singh Rajput and Kriti Sanon's film Raabta went through the CBFC process a few days ago. 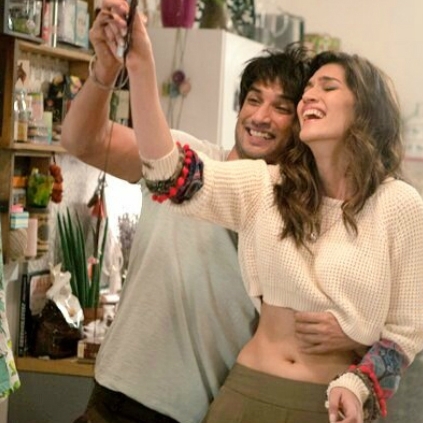 CBFC officials have chopped a long-running passionate kissing scene between the lead Sushant Singh Rajput and Kriti Sanon. Not just the hot scenes but also a few abusive dialogues have been removed from the film. Raabta is scheduled to release on June 9th, 2017. The film is directed by debutant Dinesh Vijan. The trailer of the film has created a good buzz among the moviegoers and after a remarkable performance from Sushant Singh Rajput in the Untold Story of MS Dhoni, fans have high hope on this film. The film is continuously in the limelight. Earlier we had reported that music director Pritam had asked the makers of the film not to use his name in any promotions. Later, Magadheera producers filed a copyright case on the makers as they felt Raabta is a remake of Ram Charan’s blockbuster Magadheera. With all of this, the film is still having good expectations among the fans. VIP 2 teaser review | What worked and what didn't? People looking for online information on Kriti Sanon, Raabta, Sushant Singh Rajput will find this news story useful.